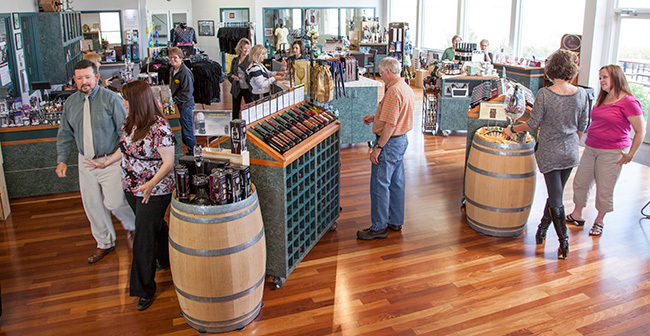 To order items from our Gift Shop, call the winery 641.672.WINE (9463). For wine purchases, we ship within the state of Iowa and to other select states. These gifts can include two, three, or 12 bottles of wine. 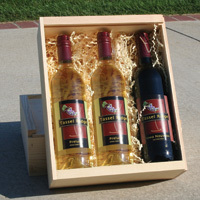 The two bottle box includes two Tassel Ridge Winery glasses. These wine boxes make a very classy and memorable gift. Prices depend on specific wines included but are in the $50–60 range for 2 and 3 bottle boxed gifts and $250 for the 12 bottle box. Have you ever been ready to serve guests, only to discover that you’d forgotten to chill the white and rosé wines you’d planned to pour? Just add ice to the CooperCooler, and chill a bottle down to 50ºF in 3.5 minutes or to 40ºF in 6 minutes. It will also chill pop and beer cans. 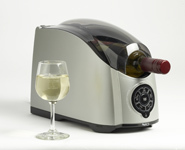 The Cooper Cooler is perfect for parties or when you want that bottle of wine cooled for a nice afternoon on the deck. Available from stock for $90 plus tax. 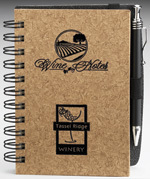 Here is the perfect place to keep notes on the wines you drink. 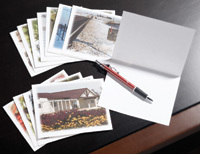 The pages are about 4 X 6 inches and provide space for details on the wine AND your tasting notes and comments. A pen with an elastic strap is provided. This wine journal will help you keep track of the wines you sample, or it makes a perfect gift for both wine novices and wine experts on your list!